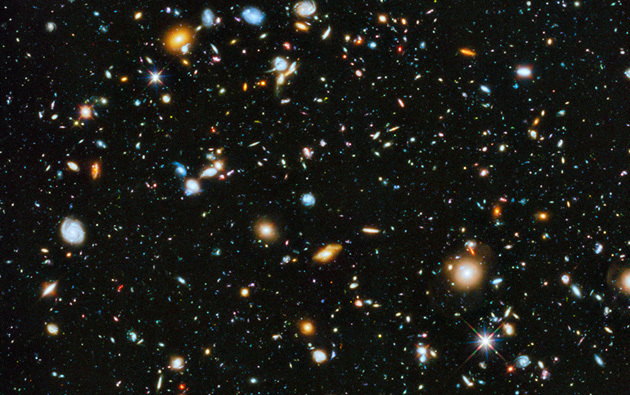 This is an image of “deep space,” taken from the Hubble telescope in 2014. At this magnification, Jupiter would almost fill half of the frame. So this is an image of a very tiny segment of the sky. As Christians we believe that this Universe is God’s creation. There are many ways to imagine this creation, depending on your image of God. Setting aside the fundamentalists and “creationism,” some believe that God simply created the universe, then let it run its course (typically this view is called “deism,” and was especially prevalent in the 18th century). Some imagine a closer relationship between God and the universe such that God can intervene in the process of evolution and history (typically this view is often called “supernatural theism” and is quite common among mainstream Christians today). Others see the universe as God’s self-expression in space and over time, if you will. (This view tends to be associated with process theology and “panentheism.”)How do you imagine the relationship of God to the universe? Regardless of your view, why would God need a Universe so big? If creation is the concrete actualization of God’s infinite potential, what do the awesome forms visible in the universe suggest of the extent of God’s creativity? Imagine, if you can, other sentient species, scattered on these billions of planets revolving around these billions of stars in these billions of galaxies… Could this Universe be one vast experiment in developing loving sentience? How successful would we be, if we were to be rated in such an experiment? What moves you most in these reflections? What resonates most with you? Least? What are you most challenged by? What do find most helpful in these reflections? Least helpful?